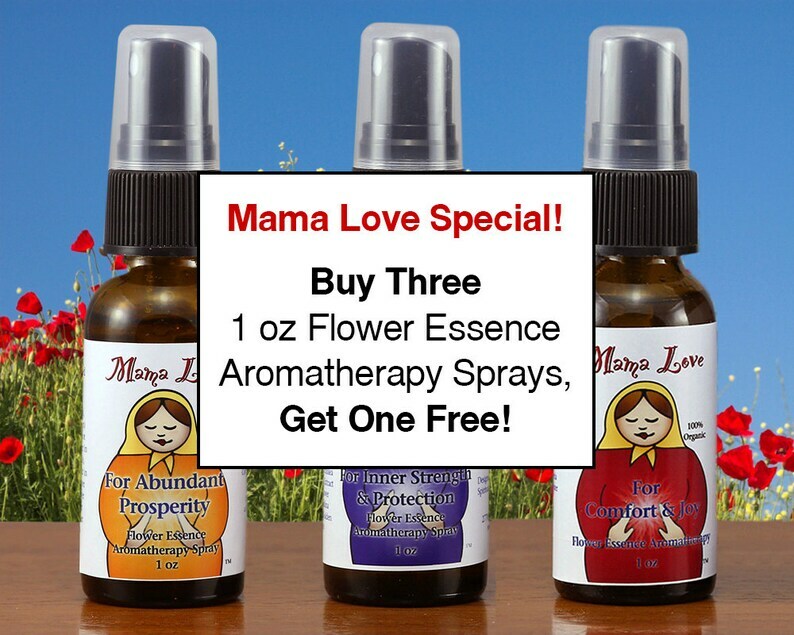 Choose any three of my 1 oz Mama Love Flower Essence Aromatherapy sprays and get one more of your choice free! Sprays are a really fun and convenient way to experience the benefits of flower essences and aromatherapy. Close your eyes and spray about your head and body and feel your energy shift. Or spray in your home, workplace or car. Ahh! They smell wonderful and can make such a difference. And the lovely power of Reiki makes them all the more effective. These spiritually guided sprays are handmade, all natural and made of at least 98% organic or ethically wildcrafted botanical ingredients. Legal Note: While these products are made to aromatherapy standards and should be safe when used as directed, it IS possible to be allergic to just about anything. If you're concerned about sensitivity check the ingredient list, do a small patch test, and only continue to use it if you like how it makes you feel.